Choosing a diesel engine in sail or power often involves lots of tradeoffs. In our case we spend most of our time at a very efficient 11.25 knots. In smooth water, with a clean bottom, it takes about 120HP to move us at this speed. Based on our average fuel consumption during the first 16,000 miles of testing we figure we are using about 140 horsepower on average for moving the boat, rough water drag, induced drag from the stabilizers, hydraulic loads and the generation of AC and DC power. Not much for all of this! When choosing an engine for our type of service you need to compare service ratings. As ratings vary somewhat between manufacturers, it pays to read the fine print. We looked at all the major engine builders before deciding to go with John Deere. 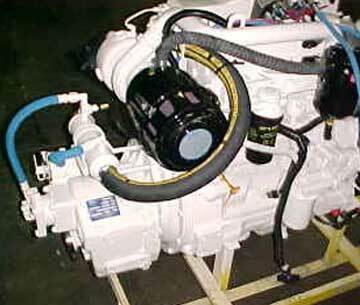 The Deere engines have an excellent reputation in the commercial fishing fleet – both as gensets and on smaller boats for propulsion. They have a number of specific features which appeal to us. But the bottom line is that they are reputed to be the most reliable engines in their class. We’ve been told that we can expect 28,000 hours plus if we maintain the engines, and they can be rebuilt in place. 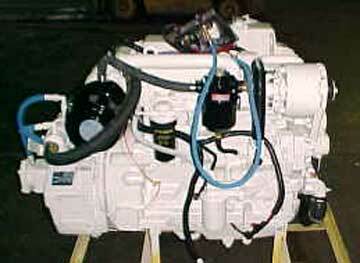 The engine we using is the Deere 4045TFM. A four cylinder turbocharged engine that delivers 150HP at 2600 RPM in its M-4 rating. The M4 rating is based on full power for one out of every 12 hours, running about 800 hours per year. 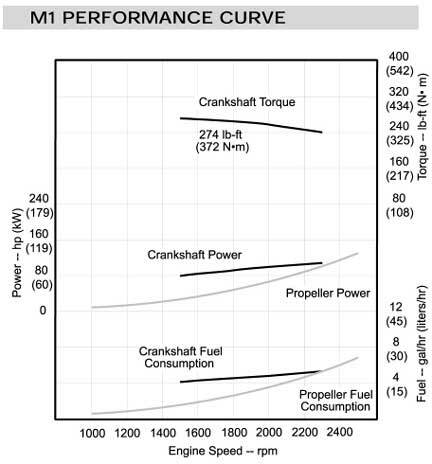 The performance curve for this engine is shown below. At the other end of the rating spectrum is the M-1 rating. This is based on uninterrupted full power 24 hours a day, and 3000 hours per year, what is called a commercial rating. 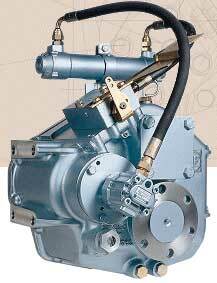 In the M-1 rating the engine delivers 105 HP at 2300 RPM. 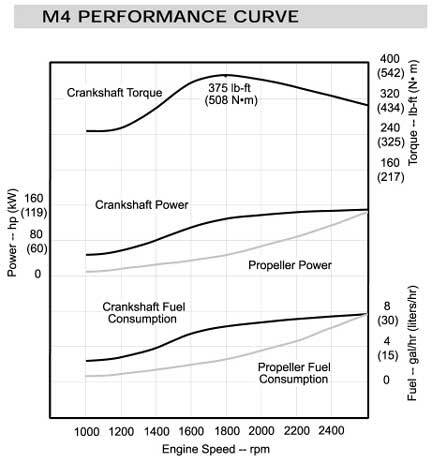 The output curve for the 4045TFM in M1 configuration is below. Physically the two engines are identical. The only difference is in the fuel pump setting. The M1 configuration is a little leaner. What we’ve seen with these engines is they have plenty of “muscle” to push us through big head seas, if the need arises. Tubocharging used to be considered a high maintenance way to increase power. However, with most modern engines this is no longer the case. The Deeres have an excellent reputation for reliability. The fact that the turbos are water cooled, and the engine does not get a lot of boost pressure from the turbo is a positive. Let’s start with the alternator installation. Diesel engines have a very strong power pulse each time a cylinder fires. These are called “torsionals” by engineers. Couple these pulses with the load of a big alternator – in our case as much as ten horsepower – and you have a recipe for disaster if the brackets are not very, very strong. Welds are to be avoided where possible, as they are subject to fatigue. Notice the thickness of the mounting brackets. While this may appear oversize, it looks just right to us. Note the “poly-V” belt (with seven ribs) shown in the photo. Towards the lower right side of the photo you can see a spring-loaded idler pulley which tensions the belt. These belts are much more efficient at transmitting power than the old-fashioned V-belts. We only found it necessary to change these belts (on a preventative basis) after 1500 hours of operation. As we’ve done with our sailboats for years now, the crank case vent system on these engines is closed. A closed system has several advantages. First, it reduces the amount of oil in the engine room air supply, which eventually coats all engine room surfaces. Next, it quiets the engine. And finally, it reduces (or eliminates) condensation on the inside of the engine after shutting down a warm engine. In this case we’re using a Racor crank case vent system. The black canister at the middle (to the right) on the engine is the Racor Crankvent. The crankcase breather feeds into this, and then it outputs the pressure into the top of the Racor air cleaner at the right of the photo (also shown below). A significant amount of the total engine noise actually comes out of the air intake. Using a large size air intake (designed as a muffler or silencer) helps to quiet this noise level. 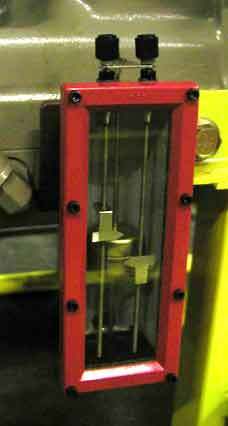 The Murphy Gauge company makes some very cool engine instruments for industrial use. We’ve been using these for years on as a back up for engine oil pressure and water temperature (for more info, see Offshore Cruising Encyclopedia page 777). For a power boat, where we will want to keep track of levels underway with the engines running, we’ve added Murphy gauges to each engine for both oil and coolant level. The image below is of the coolant level. These gauges also give us a pair of switch contacts which can be used to trigger an alarm. We’ll set these contacts at just below normal – giving us plenty of time to do something about any incipient problem (before it becomes a crisis!). Below is the oil level gauge. 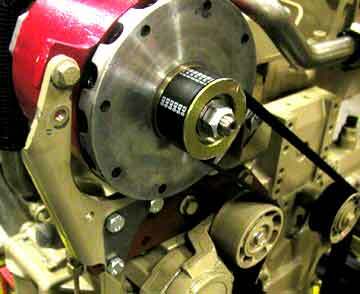 It has been our practice for many years to have a start and stop system mounted on the engine. 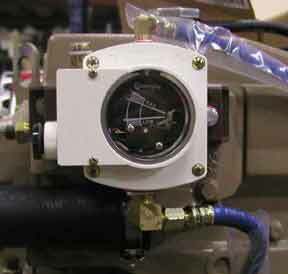 This makes it a lot easier to bleed injectors and perform other maintenance procedures. In the case of this FPB, we make it a habit to start the engines from here, so we can check things every time we get underway. These panels also have the Murphy gauges for engine oil pressure and water temperature. In addition, the engine hour meters and transmission oil pressure gauges are installed. These panels, one for each engine, will be mounted on the deckhead, so they are not subject to engine vibration. We spent an inordinate amount of time researching the correct transmissions for this boat. This is a key piece of gear, which we need to operate with 110% reliability. And we can chose from hundreds of different models from a variety of manufacturers. As with engines, there are different ratings for each transmission design, indicating the service it is likely to see. Even though our loads are relatively light (an average of just 65 horsepower per transmission under normal cruise) and the hours per year will be low (we expect between 600 and 1000 hours of operation a year) we decided to go for a commercially rated box. While this would give us the highest reliability – the transmissions should last as long as the engines without needing an overhaul (20,000+ hours), it comes at some cost in weight and finance. In casting around for the best transmission for our purposes, we zeroed in on ZF and Twin Disc as the two most suitable manufacturers. Although there are other transmission builders around, these two seem to have the best service network around the world. We ended up using a ZF280-1A box, with 2.47:1 reduction and a power take off for driving hydraulic pumps required for the stabilizer system. There is probably no more complex question on sailing or powering designs than propeller engineering and specification. The first step is to have a good handle on the smooth and rough water drag. Next is to carefully define what speed regime the prop is to be optimized towards. A powerboat is easy to deal with compared to sail, in that the thrust required is in a pretty narrow range, while a sailboat will cruise at a wide variety of speeds and loads (especially considering motorsailing). And the power boat does not have to worry about the drag of the prop when sailing. We’ve spent as much time on the propping of our sailing designs as any other aspect of engineering. Because of prop drag when sailing, we’ve always used MaxProps or Hundested controllable pitch props (both of which feather). The Hundesteds are more efficient than the Max Props, but also a lot more drag with their larger hubs and twisted blades. These have always been three-bladed props. On the FPB we don’t have to worry about prop drag. What we are after is maximum efficiency and minimum noise and vibration. We do not want to be disturbed by the thump thumb throb of props. The engine manufacturers want their engines to be able to turn up to their rated RPM, during sea-trials, at moderate load. For heavily loaded props, like you find on slow moving commercial boats and trawler designs, there are large efficiency gains which come with increasing diameter and slowing RPM. But on a design like the FPB, with small HP requirements and low prop loading, you quickly reach a point after which diameter does not yield benefits commensurate with the negatives such as deeper draft. After lots of study and consultation with a variety of “experts”, we ended up with the previously mentioned 2.46 – 1 reduction gear. This in turn got us to a prop diameter of 26″ (650mm). This diameter allows us a tip clearance of about 20% – more than the 12 to 15% which is normal – which in turn yields substantial benefits in noise and vibration. Props are typically made from two forms of bronze. Nibral bronze, the good stuff, costs about 30% more, and is significantly stronger. On highly loaded props you are often forced to use Nibral Bronze. We do not have this problem, because our loads are so light. However, Nibral bronze is a lot more damage tolerant. In other words, it can chop through a larger piece of timber before it gets dinged. As you might expect, we use Nibral bronze. Then there is the matter of propeller design. There are as many propeller designs as there are manufacturers – most have numerous types in their inventory. Blade shape, sweep angle, curvature, and a host of other critical design elements such as tip cupping vary. The array of propellers from which we can now chose has been made even more difficult with the advent of computer controlled machining. It is relatively easy to create and build new designs. 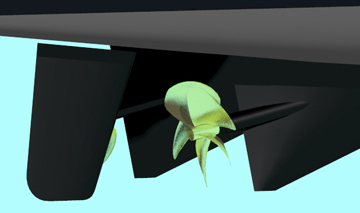 As this is a powerboat, and the engines will be running all of the time that we are underway, we want to have the most efficient propeller possible. We also want the quietest props available (we expect the engines to be virtually silent – prop noise is something else – which is why we’ve got so much tip clearance and such heavy scantlings in the way of the drive shaft supports and plating). While we figured our normal cruising speed would be around 11 knots, we want to be able to absorb max power at slower speeds when slugging through big seas. Top speed is not as important as being able deal with the heavy weather. We are now on our third set of props. These are very close to optimum. They have ZF four bladed wheels, with a blade area ratio of 70%. Average fuel consumption at eleven knots is now down to seven US gallons per hour. This entry was posted on Thursday, October 20th, 2011 at 1:52 pm and is filed under Dashew Offshore, FPB 83. Both comments and pings are currently closed. Thanks a lot for sharing your technical know-how. I get a lot of inspiration reading your blogg. I have learned that you did some over-pitching with the high revolving Yanmar on your Beowoolf. How much lower than the all out max rpm did you allow your engine to run after over-pitching? The question of over pitching is based on the type of prop, engine, operating conditions, etc. With Beowulf we used a Hundested controllable pitch prop, so set the pitch/RPM based on EGT. With other yachts and Max feathering props we often over pitched 15/20% but were careful how we used the engines. Lots more on this subject in our Offshore Cruising Encyclopedia.